The mere mention of Bali evokes thoughts of a paradise. It’s more than a place; it’s a mood, an aspiration, a tropical state of mind. 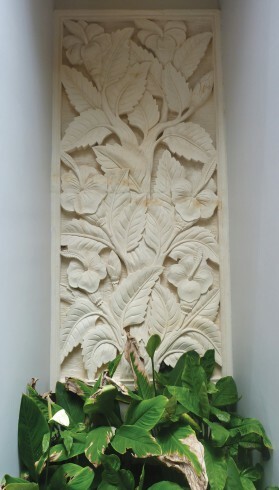 NC Design team has recreated this very charm in their Balinese style garden that stands alone to speak volumes. Water spouts spilling fresh water into the pool add to the casual elegance of the garden. Balinese landscape design is a vernacular design style that inhabits the volcanic islands of Bali, Indonesia. Today contemporary Balinese style has become known to be the most popular Asian tropical line of design that combines traditional aesthetic principles, the island’s abundance of natural materials, consummate craftsmanship of its people and international influences, techniques and trends. The Ulu Villa located in Jimbaran-Bali inside the Taman Mumbul residence boasts of a garden that is replete with all the ingredients required to label it an accurate Balinese style. 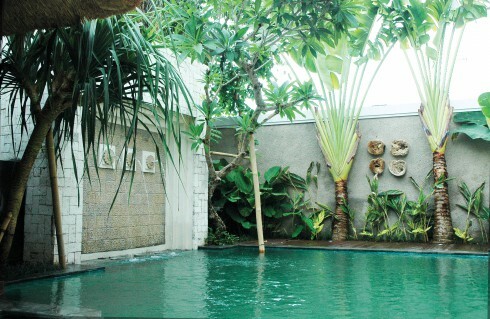 The private villa landscaped by Dewa Kusuma uses nature as a way of ritual expression. Smooth round pebbles fill the gaps between successive terrazzo stone blocks, fringed by a local variety of soft shrubs. Located in the midst of urban hustle-bustle, the villa’s surroundings offer an air of tranquillity and serenity, making it a perfect location for people to release their stress and rejuvenate under the vibe of a new energy. Drawing their cue from this note, the architectural firm NC Design explain, “We consider the relationship between landscape, architecture and the individual to be fundamental in our design.” Thus grew a right mix of vernacular and global influences under the adept hands of Dewa Kusuma. 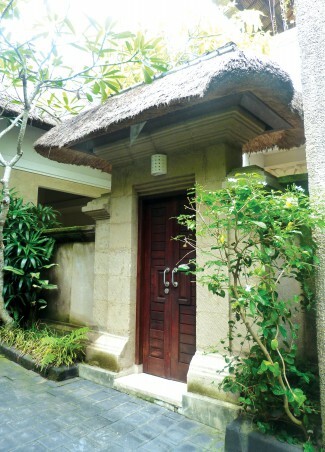 Standing under a thatched roof, a Balinese traditional gate that wears a modern touch greets guests before they enter. A Frangipani tree accompanied by a clump of Cordyline Terminalis is placed in front of the gate. Behind the gate, an intermediary space directs the guests into the living room. A garden without its water feature is like a sentence without its verb and NC Design has framed it right. They explain, “Our response to any project is to pay close attention to all details required for a successful outcome.” A pair of ponds on either side of the gate reflects the sky above and adds a sense of cheer as one enters. They say there is nothing like art to bring out the grand lines of nature. Along the wall, behind the gate, stone murals depicting dense foliage reinforce the traditional Balinese look. An inseparable part of the Balinese garden is the presence of natural stone. The design team has finished the paths and pool deck with terrazzo casting stone that flaunts a creamy white shade that offsets the Balinese colour palette. 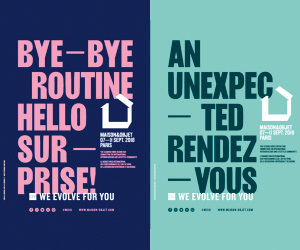 Playing up the differences between one object and another, the design team has created all sorts of juxtapositions; of rough and smooth, and of dark and light. This area becomes a focal point visible from the living-dining room, master bedroom and other rooms on the first floor. 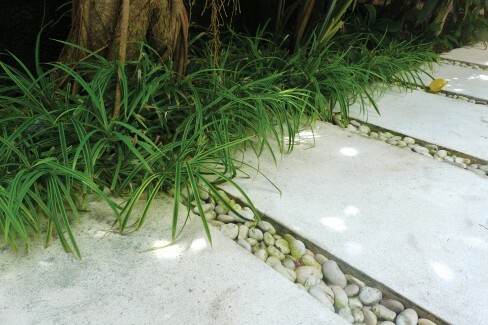 Smooth round pebbles fill the gaps between successive terrazzo stone blocks, fringed by a local variety of soft shrubs. The outdoor activity for each villa is centred in the swimming pool area. 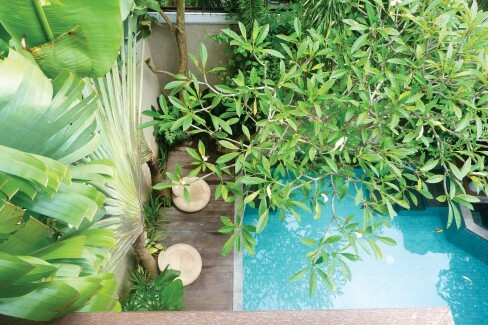 This space is accessorised with features reminiscent of a tropical haven. Tucked in the corner of the pool is a stone feature wall clad in square cut limestone enhanced by up-lights and rustic carved tiles. Water spouts spewing fresh water into the pool add to the casual elegance of the garden. A Frangipani and Pandanus tree frame the stone wall lending a touch of green to the calm blue, white and grey palette. The area becomes a focal point visible from the living-dining room, master bedroom and other rooms on the first floor. The architectural team has continued to take the aesthetic beauty of the garden on to the other end. The team shares, “Every architectural object is linked to a specific place and is the consequence of the basic need.” A gazebo for outdoor seating is suitable for the theme especially if it’s covered with a Balinese thatched roof. Standing near the spa pool it is finished with treated hardwood that also forms the roof truss. 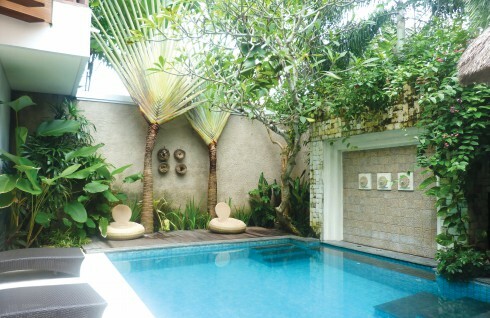 The swimming pool has been clad in clear blue mosaic tiles to maximise the fresh look of the water. Local black basaltic andesite stone borders the pool in an unexpected contrast that creates a vibrant energy. The dark stone offsets the pool making it stand out. Light colours on the hardscape elements match the colour scheme of the building. Standing under a thatched roof, a Balinese traditional gate wearing a modern touch greets the guests before they enter. An incredible collection of plants throng the space – each vying for attention. Softscaping the garden are plants like Ravenala Madagascariensis, Spathodea Campanulata, Wodyetia Bifurcata, Cocos Nucifera, Michelia Alba and some accent plants such as Pleomele or Song of India, Hibiscus Rosa Sinensis and Heliconias to name a few. These are strategically placed to introduce points of interest. Slender tall trees and palms not only provide a highly effective windbreak in the garden but also help in establishing privacy. This garden designed by NC Design not only radiates a timeless appeal but also takes care that everything is in just the right place to come together for that perfect Bali look.